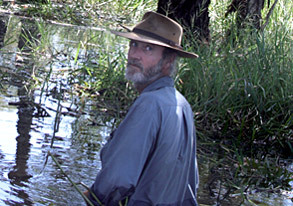 Ten Canoes (Rolf de Heer, 2006) is Australia’s most ambitious and most expensive cross-cultural film project to date. The Balanda and the Bark Canoes (Molly Reynolds, Tania Nehme and Rolf de Heer, 2006) that takes us behind the scenes of this film to provide invaluable insight into the extraordinary processes of collaboration between Balanda (“white-fella”), director Rolf de Heer and the Yolngu people of Ramingining. I think that is the issue. It is about appropriation in some respects, because the Western notion of the artist as hero goes right up against Indigenous cultural paradigms of cultural material belonging to the community from whence it comes from. I was reminded of Miller’s comments about the figure of the “artist as hero” when I was watching The Balanda and the Bark Canoes, for de Heer in some ways could be seen as this. He comes to Ten Canoes as a maverick director in the Australian cinema, known for his innovative art-house films, each of which differs from the one before it and each of which takes on difficult characters and subjects, including Miles Davis in Dingo (1991), cerebral palsy in Dance to My Song (1997) and frontier massacres in The Tracker (2002). In The Balanda, his narration of making Ten Canoes is delivered in a fairly lofty, “voice-of-God” mode, creating a certain distance between himself and the subject. This distance is reinforced by the opening lines of the narration, in which de Heer confesses: “For me [Ten Canoes] is the most difficult film I have ever made, in the most foreign land I’ve been too … and it is Australia.” I remember wincing slightly when I heard these lines that invoke the European (and, I would add, masculine) fantasy of the artist as adventurer-hero exploring the uncharted territories of the Other. But, as the story unfolds, de Heer emerges as a very different figure from this. He is appears as an extremely talented, resourceful and remarkably non-egotistical filmmaker who worked extremely closely with equally talented members of the Ramingining community to enable the telling of a Yolngu story in a Yolngu way. We also learn that, far from being an act of appropriation, the making of this film involved the work of reappropriation and cultural adaptation, leading to the renewal of many forms of Yolgnu culture that had previously been discontinued. The film began when I showed a photograph from Donald Doctor Thomson to Rolf de Heer and said what do you think? Rolf de Heer started to write that story with Ramingining people, my people, and we started to work together. Returning to Adelaide with this new film forming in his mind, de Heer began researching the Thomson photograph. He discovered Thomson took some four thousand black-and-white glass plate photographs of Yolngu people and culture in the mid-1930s, and these images, known as the Thomson Collection, are held in Museum Victoria. De Heer undertook to study the collection, looking at more than 2,000 photographs. But in his discussions with Gulpilil and others in Ramingining, he also discovered something else. While these photos were taken at a time when anthropologists collected such images with the aim of “preserving” for science what they considered to be a dying culture, they have since been reappropriated by the Yolngu people as a new form of cultural memory. (5) For this reason, de Heer was able to use the photographs in the scriptwriting process as triggers for discussion – “incident”, he says, “could be derived from each image […] each photo had, in some way, a story that illuminated the whole of the endeavour”. It is one thing to use photographs as an aid to memory, it’s quite another thing to translate the stories emerging from these photographs into cinematic language. De Heer has identified three main difficulties he and his collaborators had to overcome in order to do this. 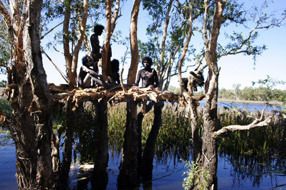 First, there was the desire of the Yolngu participants to make goose-egg hunting (depicted in the Thomson photo of the ten canoeists) central to the film. They saw the film as an opportunity to revive this practice, which had been discontinued for many years. The practicalities of this presented major problems from a film producers’ point of view. It meant the film had to be shot on location in some of the most dense areas of the Arufura swamp, country known for its extreme physical conditions, not to mention mosquitoes, leeches and crocodiles. The decision to make goose-egg hunting the main event also raised a problem for de Heer as a scriptwriter about how to make this film dramatic. How could he satisfy the Yolngu taste and cultural requirements while at the same time make something that Western audiences would want to see. Lastly, for de Heer, there was the problem of meeting the Yolngu requirement that this story about “old times” be true to their cultural history. This was a problem because de Heer had been contracted to make a colour film while Yolngu cultural history, which is now represented in/through the Thomson photographs, is in “black and white”. All these problems were overcome, however, when de Heer introduced the device of having the main dramatic part of the story set in dreaming time, which, according to Yolngu culture, is a time when anything is allowed to happen. As a result, Ten Canoes is a stunningly beautiful film that switches between an unspecified historical time, which is depicted in black and white and, through the use of static frames, mimics the Thomson photographs, and dreaming time, which is depicted in a magical swirl of colour and movement. De Heer’s decision to run with a form that involves a layering of time is just one of the many ways in which the use of culturally appropriate forms of storytelling led to production decisions that might not be taken on a non-Yolngu film. In The Balanda, we learn that the film was cast in a Yolngu way. For the Yolngu participants, it was crucial that characters that are meant to be related in the film should be played by people who have proper kin relations in real life. This approach goes up against Western practices of casting, including the role of the director as the person who makes the final decision about the cast and the use of factors such as appearance and talent when he/she decides who will be cast. But this approach has also led to many standout performances. Richard Birrinbirrin, for example, almost certainly would not have considered for a role in this film if the Western criteria for casting in historical dramas had been applied. This is because of his appearance. He’s got a very fat belly and this would have been regarded as inconsistent with the historical setting. For cultural reasons, however, Yolngu people involved in the film expected Birrinbirrin to have a role, forcing de Heer to invent the comedic part of Birrinbirrin, the old man who is always after honey and eats too much. As it turns out, this is an inspired part, the source of a great deal of the film’s humour and appeal. The desire of all involved to tell the story of the ten canoes in a Yolngu way is also reflected in the use of Yolngu languages in the film. When Philip Noyce was asked why he didn’t use Aboriginal languages throughout his feature film, Rabbit-Proof Fence (2002), he said that he didn’t think mainstream audiences would pay to see a subtitled film of this kind. The producers of Ten Canoes were, it seems, prepared to take this risk and their gamble has paid off. One of the real attractions of the film is that it is the first feature film to be made in an Aboriginal language (predominately Ganalbingu, but also some Mandalpingu). As a result, there are several versions of the film. The version released in Australia is subtitled in English and has a narration spoken in English by David Gulpilil. International versions of the film will use subtitles in various languages for both the dialogue and Gulpilil’s voice-over. According to de Heer, the producers’ decision to not allow any dubbing in the international versions of the film reflects the importance of language in this film to both its form and meaning. While it’s true that few people outside the Ramingining area may understand the languages spoken on screen, the film’s themes of communication, miscommunication and proper understanding prompt us to think about the importance of listening carefully to what is being said. In this way, the film leaves us with a strong sense that what we were hearing is a language that is very much alive. Most reviews of Ten Canoes praise the way in which the film takes us back to dreaming time, what Westerners call mythic time. Less attention has been paid to the temporal aspects of the narration. Although this story of a story comes to us from another time, a time before “white-fellas”, the narration also serves to bring this story into the now time of the film’s reception. This is achieved not only through forms of direct address but also because it is performed by David Gulpilil. De Heer has talked about how the last minute decision to use Gulpilil as the narrator helped Gulpilil to reconcile with his community and this project. It also allows for a kind of playful humour in the narration that Gulpilil is well known for. There is the Star Wars (George Lucas, 1977) allusion in the film’s opening, for example. There is also at times a gentle form of jibbing that Gulpulil often employs to turn questions back onto his Balanda audiences. In closing this film, the narrator/Gulpilil (and I want to insist that for many it’s the latter) says, “This is not your story. But it’s a good one just the same.” The film shares the Yolngu story with us, but we cannot own it. Gulpilil challenges us here to recognize the difference of Yolngu people and culture and to respect it, all the same. Everything is changing, everything is going, going, gone now. The only thing the children know is some ceremony […] they not even normal kids anymore. Maybe they gonna keep this film with them so they can put it in their head. As a cultural memory in these kids’ heads and ours, Ten Canoes takes us back to the past not in order to ‘preserve’ it, but to integrate it into the present and thus ensure a Yolngu cultural future. One of the most influential texts in this debate is Marcia Langton’s Well, I heard it on the radio and I saw it on the television: an essay for the Australian Film Commission on the politics and aesthetics of filmmaking by and about Aboriginal people and things (Sydney: Australian Film Commission, 1993). Also see Eric Michaels’ groundbreaking essays on cross-cultural media, including “For a Culture Future”, which have been edited by Paul Foss and published as Bad Aboriginal Art (University of Minnesota Press, 1994). For an excellent overview of this history and a provocative contribution to the debates on protocols, see Frances Peters-Little, “The Impossibility of Pleasing Everybody: A Legitimate Role For White Filmmakers Making Black Film”, in Australian Humanities Review. Insight, “Cultural Rights Debate”, SBS, 28 March 2002. Ten Canoes press kit, Palace Films, 2006. For a wide selection of essays on cultural appropriation, see Bruce Ziff and P. V. Rao (Eds), Borrowed Power: Essays on Cultural Appropriation (New Brunswick, N.J.: Rutgers University Press, 1997). The Ten Canoes Agreement recognizes the Ramingining community’s property rights for all artefacts and sets made for the film. These materials were included in a recent multi-media art/cultural exhibition. Spin-off projects include: Eleven Canoes, a video-training project for young people in Ramingining; Twelve Canoes, a web-site project; Thirteen Canoes, a multi-media art/cultural exhibition; Fourteen Canoes, a proposed book that uses images from Ten Canoes and words by Yolngu participants to demystify the people in the Thomson photographs; Fifteen Canoes, a music preservation project; Sixteen Canoes, the restoration of the closed-circuit television set up in Ramingining; Seventeen Canoes, a video-exchange project with other remote communities; and Eighteen Canoes, now called The Balanda and the Bark Canoes, a one-hour television documentary about the effect of Ten Canoes on the community.